Hi everyone and happy July! 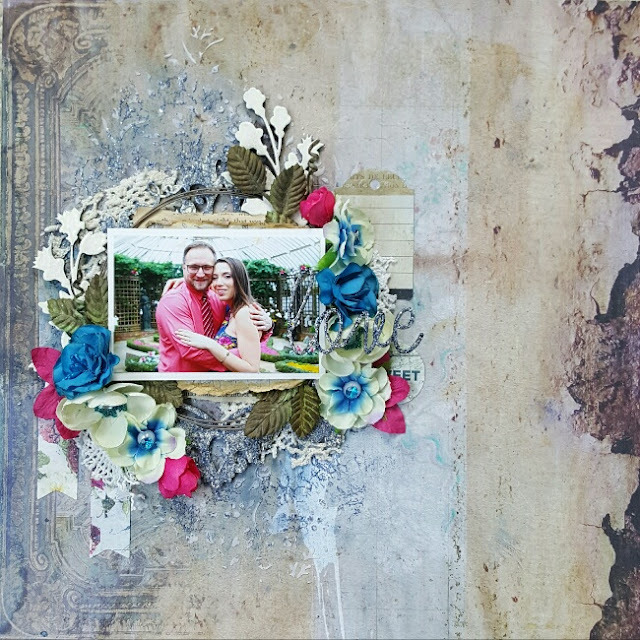 I have a few layouts to share with you this month using the newest Tattered Walls Collection. On with the show! My background paper is "The Powder Room" from the Tattered Walls Collection. Under the photo I used a piece of "The Reading Room" paper painted brown around the edges. I used a lot of different flowers from various sets on my layout. To begin, I took the pink flower from the Summer Blossoms collection and took the two pieces apart. I then had two buds to use for my project - I just folded them and put them in place. The flower with the blue gem in the middle is from the new Spring Blooms set. The off-white flower is from the Fresh Florals set. I removed the stamens, added a gem and put the new Aquamarine Seedlings around it. 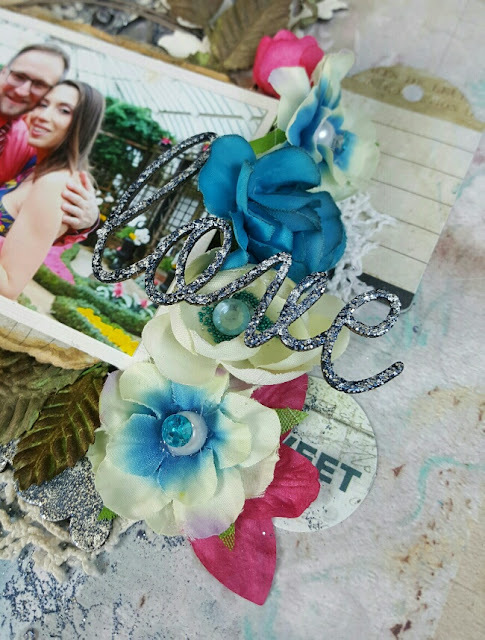 The large blue flower is from the Heartland Blossoms set and the pink petals under it is half of a flower from the Spring Florals set. The vine you see around the picture is from the Wanderlust Vine set spritzed with a shimmering brown spray mist. I used the Garden Daisies chipboard behind my flowers and embossed it with Ivory embossing powder. I used various pieces of the Tattered Walls Ephemera around my layout for interest. 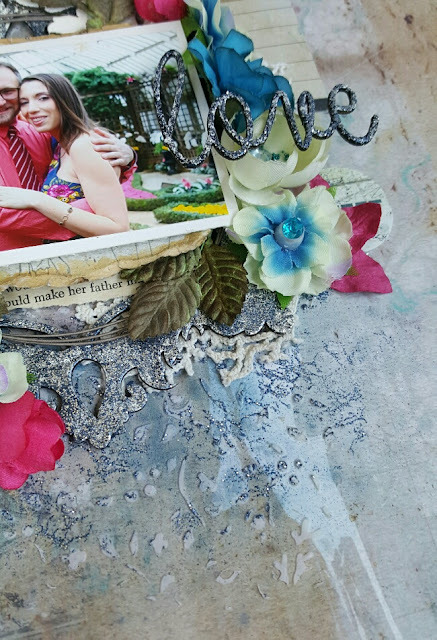 The title Love is from the Adore, Love, Cherish chipboard set. I first embossed it in Ivory, then I used the Crackle Textures stamp to emboss the crackles with the new Sparkling Navy embossing powder. I did the same thing with the new Glam Frame behind the picture. The background was just created by using texture paste with a stencil. Then I used the Crackle Textures stamp with Sparkling Navy embossing powder for more texture. I then added a blue spray mist over it. Tattered Walls - "The Powder Room"
Tattered Walls - "The Reading Room"
For my second layout I used the back side of the Tattered Walls Apartment B paper. It is difficult to see under all of the paints and gesso, but I used strips of the orange Tattered Walls The Reading Room paper. As matting under the picture, I used an old scrap piece of the Amber and Apricot Chapters paper with the London Chronicles stamp. The white and peach roses are from the Happy Roses set. I added some Mocha Glitter on the tips. 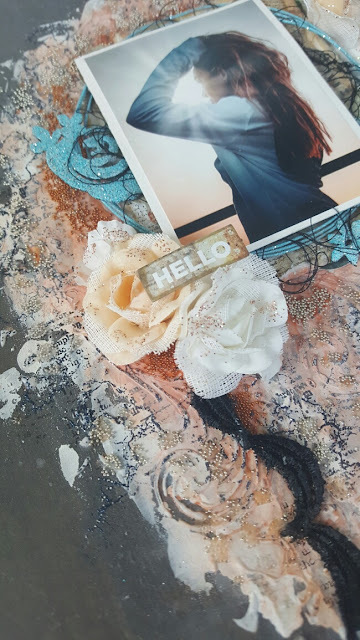 The title "Hello" is a piece of the Tattered Walls Ephemera. 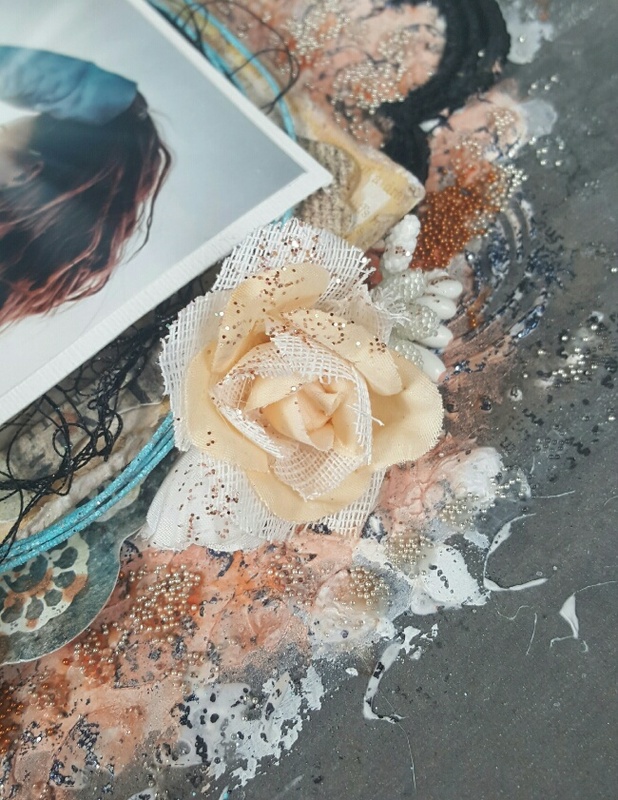 I also added a couple of pieces of Lace 3B. 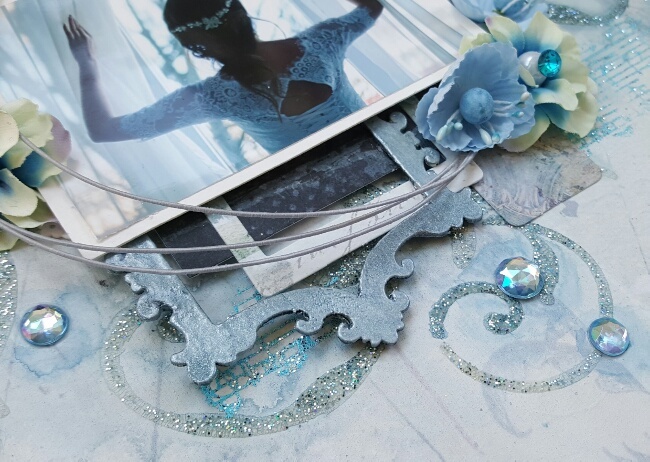 Around the picture area, I used the Crackle Textures stamp with the new Sparkling Navy embossing powder for interest. In addition, I used the Tattered Newsprint stamp with black solvent ink around the white gesso areas. Next, you can see the Paprika seedlings that I added around the picture. I also put some Silver Seedlings around these areas because they match well with the picture. The rose buds are the two pieces of one of the Christmas Blooms flowers tucked under the roses. Under the picture, I have tucked in a few pieces of the Tattered Walls Ephemera. 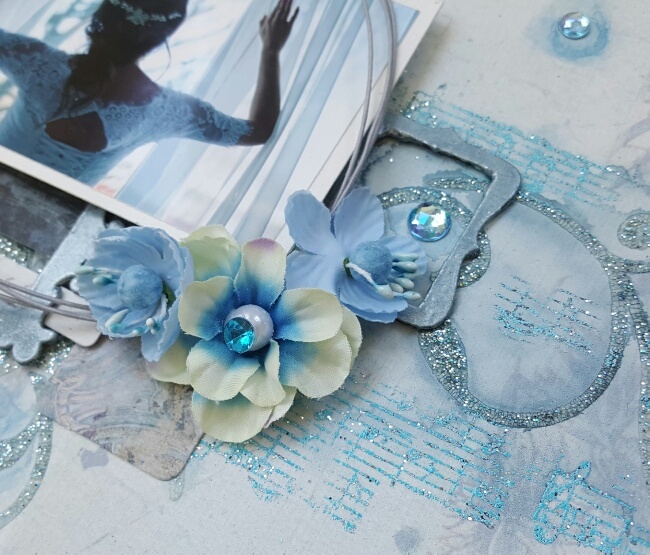 The chipboard I used is the new A Spring Day chipboard that I cut into 3 pieces then I embossed the pieces with the new Azul embossing powder. Finally, below the Silver Seedlings, I added some Clear seedlings. 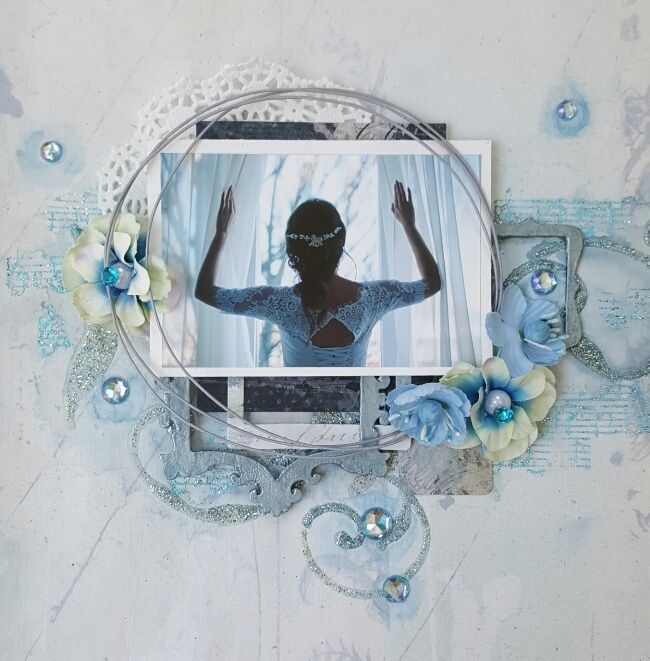 Finally, my last layout uses The Powder Room paper from the Tattered Walls Collection. To soften the background, I put on two coats of diluted gesso. I chose to use the Journey chipboard title at the bottom. 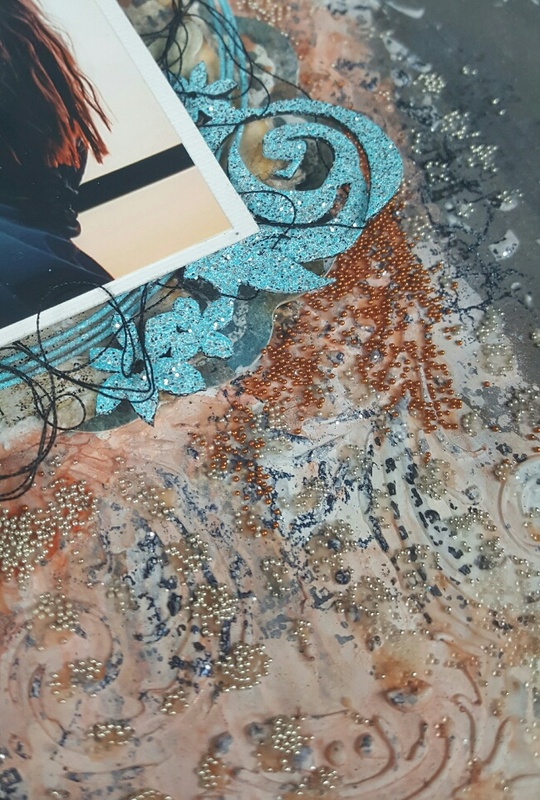 All of my chipboard was painted with a blue paint first, then I used Pearl embossing powder to emboss the pieces. 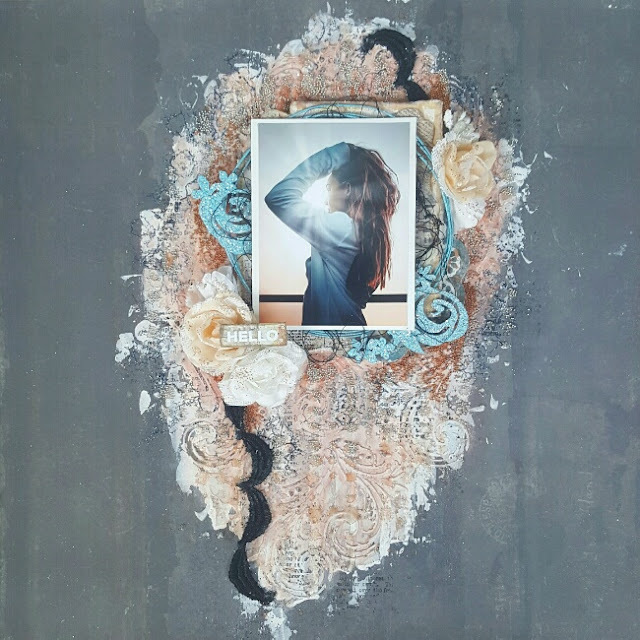 Next to the photo, I chose to use two pieces from the new Classic Mini Frames set (painted blue then embossed with Pearl embossing powder). 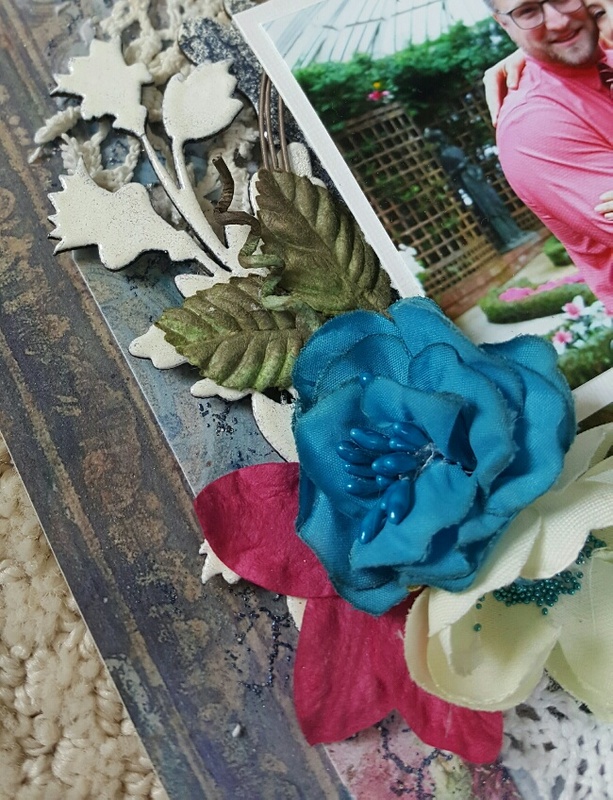 The blue flowers are from the Chesterville Blooms set. 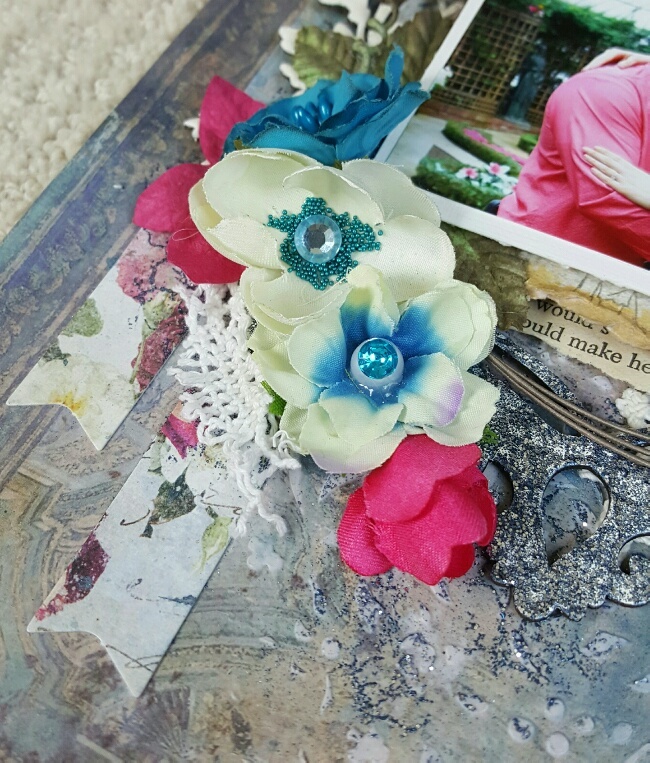 The new flowers with the blue gems are from the Spring Blooms set. For the stenciled areas, I used clear crackle texture paste and added Blue Ice glitter over the areas. I used the crackle texture paste so that when I painted around the stenciled areas, the paint would repel from the glittered areas. 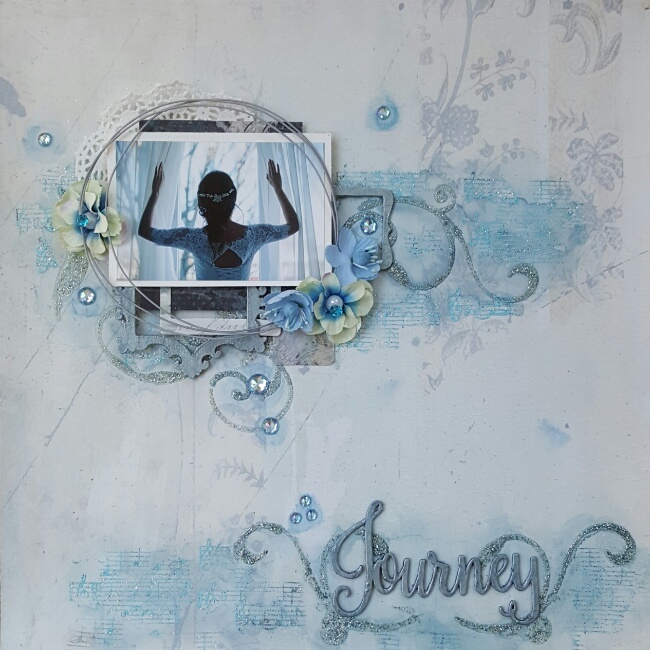 You can see around my stenciled area that I used the music notes from the For the Birds stamp set embossed with our new Azul embossing powder. And lastly, you can see the Tattered Walls Ephemera that I used under my picture. I hope everyone has a wonderful July! I will see you back here next month.